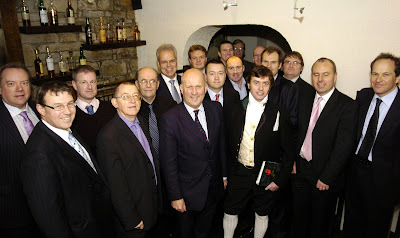 THE latest meeting of the Elite Ayrshire Business Circle was a Burns Lunch held at Fouters Restaurant in Ayr. 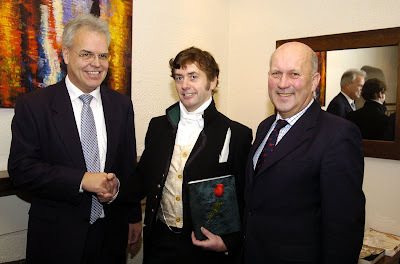 Guests of honour included John Scott MSP for Ayr, invited members of the press, and Scotland’s national bard himself, Rabbie Burns. Rabbie recited the Selkirk Grace as Fouters head chef George Ramage and his team served up a resplendent menu of traditional Scottish fare. After lunch Rabbie led a discussion about how local businesses could make better use of the Burns name and tradition in marketing brand Ayrshire, with Homecoming Scotland - www.homecomingscotland.com - just around the corner in 2009 particularly in mind. The next meeting of the Circle will be a presentation about the implications for business of Alistair Darling’s first Budget as Chancellor of the Exchequer, led by Sinclair Scott Chartered Accountants and hosted by Clydesdale Bank Financial Solutions Centre in Ayr. Date to be announced nearer the time. Its purpose is to celebrate and promote the rich diversity of industry, commerce and business services available within the county boundaries of Ayrshire. John Scott MSP commented: "Representing some of Ayrshire’s premier companies, the Elite Ayrshire Business Circle plays a valuable role in boosting the Ayrshire economy and in particular promoting through the internet the benefits of doing business in Ayrshire. I’m delighted to support the aims of the Elite Ayrshire Business Circle, and wish them continued success in the excellent work they do."